The following is my understanding of how the VLZ was discovered. The opinions expressed here are my own and may not necessarily reflect the opinion of the other people involved. I have a somewhat limited amount of information to go from so I do not know all of the details but will share what I have learned. If anybody knows otherwise, it would be greatly appreciated if you could point out any mistakes I make. Thanks. I believe it was in the fall of 2010 that a series of synchronistic events lead to a woman by the name of Mary discovering a landscape Zodiac here in Victoria, British Columbia, Canada. As is often the case with people that make these kind of discoveries, Mary had a somewhat tramatic personal experience that changed her life causing a shift in her consciousness and heightening her awareness. One day while Mary was out walking her dog around Rithet’s Bog in the Broadmead area of Victoria, she became aware of two ‘high energy’ points on opposite sides of the bog. When she returned home, Mary marked the two points on a map and drew a line between them. 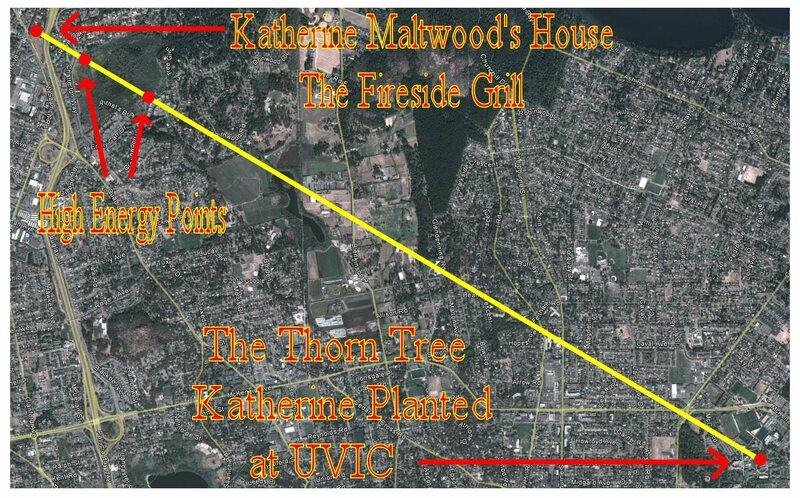 She noticed that the line pointed directly to Katherine Maltwood’s house ‘The Thatch’ which is now the Fireside Grill Restaurant in the Royal Oak area of Victoria. Mary then began researching Katherine Maltwood. 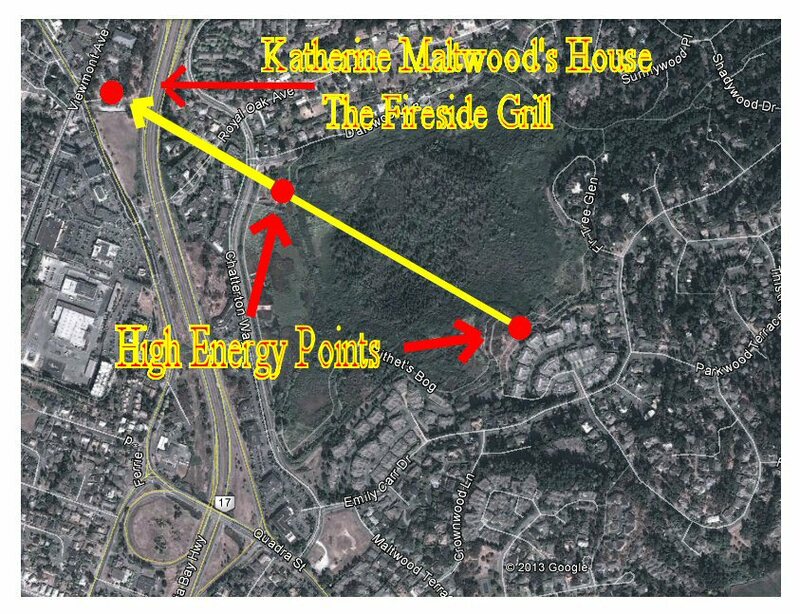 The two ‘high energy point’ on either side of Rithet’s Bog pointing to Katherine Maltwood’s House, ‘The Thatch’ now the Fireside Grill Restaurant in the Royal Oak area of Victoria, BC, Canada. Mary found out the Katherine Emma Maltwood (seen in the image below) was a rather wealthy sculptress who in around 1925 discovered the ‘Temple of the Stars’ Landscape Zodiac in the Somerset area of England while studying The High Histories of the Holy Grail. 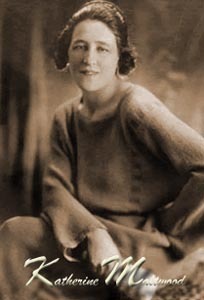 In 1938, Katherine and her Husband John moved to Victoria BC, Canada. 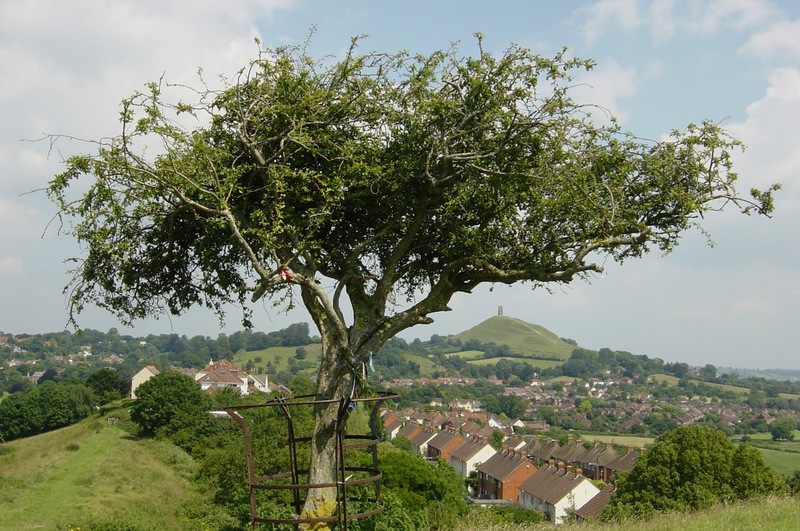 Mary learned that, before leaving Glastonbury England, Katherine Maltwood took a cut of the ‘Holy Thorn Tree of Glastonbury’ and planted it in Victoria BC. 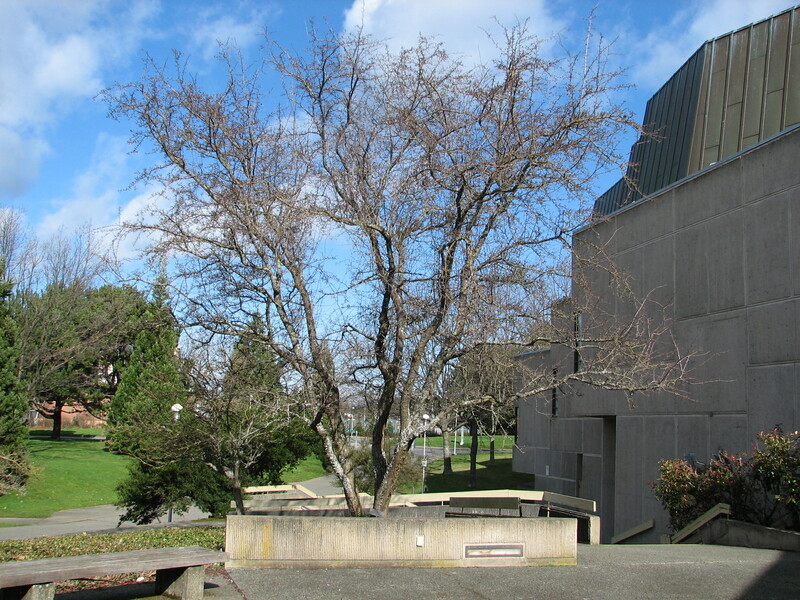 My understanding is that Katherine planted the tree on her property but it was later moved to UVIC (the University of Victoria, BC) after Katherine’s passing and bequeathing of her belonging to the city of Victoria. Mary drove to UVIC to search of the tree not really knowing where to begin looking. As she approached the University, She picked up on the same ‘high energy’ that she felt around Rithet’s Bog which guided her straight to the tree. This picture is of the plaque at the base of the tree. 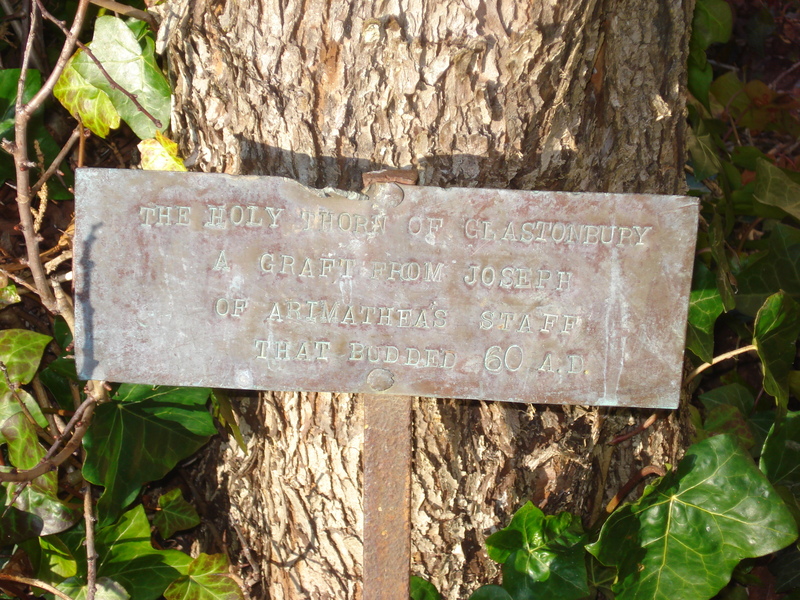 It reads; The Holy Thorn Tree of Glastonbury. A Graft from Joesph of Arimathea’s Staff that Budded 60 A.D.
Victoria’s ‘Holy Thorn Tree’ brought to Victoria in 1938 by Katherine Maltwood. After figuring out the location of the thorn tree, Mary marked this point on her map as well and found that it fell into perfect alignment with the points around the bog and Katherine’s house. I believe it was at around this moment that Mary realized that there is a very good chance that there is a Landscape Zodiac in Victoria as well. Mary got herself a copy of the Glastonbury Landscape Zodiac map from Coleston Brown’s ‘Magical Ways’ website to compare to her map of Victoria. She noticed that Coleston’s map had the fixed cross (cross formed by drawing lines between the four royal/fixed stars Regulus & Fomalhaut and Aldebaran & Antares) marked on it. Mary figured that the line she found between Katherine Maltwood’s house and the thorn tree might be one of the lines of Victoria’s fixed cross. She held the maps together and spun them trying to find something that would line up. Then it happened. Mary noticed that the shape of Glastonbury’s Aquarius/Phoenix resembled the shape of Victoria’s Caboro Bay. Everything else just fell into place and she quickly began figuring out the rough location of the zodiac effigies. Though Mary used the Glastonbury Aquarius/Phoenix to figure out the Victoria zodiac, Aquarius was not the first Victoria Zodiac effigy that she discovered. Instead of a Phoenix, Victoria’s Aquarius is the more commonly seen water-bearer. Note though that the Phoenix Theater is located on Victoria’s Aquarius. As was the case in both the Glastonbury and Kingston Zodiacs, Leo was the first effigy discovered in Victoria. In the Glastonbury zodiac, Leo’s belly follows the contours of the River Cary. In the Victoria Zodiac, Leo’s belly follow the contours of Carey Road. Both Leos have a St. Michael and All Angels Church on one of their front paws. Leo’s mane/head in Glastonbury is formed by Copley Wood. Victoria’s Leo has a Copley park on his left elbow. These are just a few of the many similarities between aspects of the Glastonbury and Victoria Landscape Zodiacs. Mary discovered 11 effigies in total. Aries, Taurus, Gemini, Argo Navis (Moon-boat which, like in Glastonbury, is said to represent Cancer), Leo, Virgo, Libra, Scorpio, Sagittarius, Capricorn and Aquarius. Like Katherine Maltwood in Glastonbury and Mary Caine in Kingston, Mary never found a Cancer effigy but the Argo Navis instead. She never found the Pisces effigy either. Because Victoria was founded while the Sun was in Pisces and because it is surrounded by water, Mary figured that Victoria is a Pisces and that Pisces was everywhere yet nowhere at the same time. By the time I met Mary and learned about the Victoria Zodiac, she still had not discovered the Cancer or Pisces effigies which left them open for me to discover which I did. More on them in a future post. I am quite new to WordPress so I still have a lot to learn about it. I will be adding a lot more content to this site over the next little while. In the mean time, if you wish to learn more about the VLZ I have quite a bit of information posted on my Teachings of the White Raven facebook page at the following link. To be continued . . . Much more to come . . . Fantastic launch to your opus, Donald! An exciting read. Thank you very much for taking the time to check out our work Mel. Lots more to come. Stumbled upon this site tonight I am fascinated. Definitely understand the feeling of high energy that your friend Mary felt a very strange feeling washes over me every time I return to this island. When I first came here it was so obvious to me out of all my travels that this was a very powerful place indeed. Although I guess there’s probably something to be said about the fact we all choose to live on our little island in our own little magical world. I am terrible sorry that I missed your comment. I am not very tech savvy and don’t tend to this blog much. Trying to find time to attend to it more often. Victoria is a very interesting place. Been on the island for about 22 years. Still not too sure what to think of it.